Scholarships are offered for the students with Z -score of 1.8 and above for BSc Engineering & Bachelor of Architecture Degree Programmes. Terms & Conditions apply. Candidates should apply online. 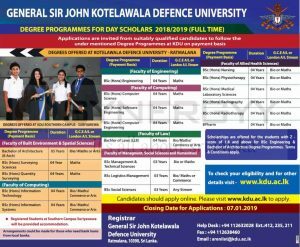 Please visit www.kdu.ac.lk to apply. *Registered Students at Southern Campus Suriyawewa will be provided accommodation. Arrangements could be made for those who need bank loans from local banks. Postgraduate courses in Water Resources Engineering and Management and Water Resources Management from University of Moratuwa. Applications are invited for the above courses conducted by the UNESCO Madanjeet Centre for South Asia Water Management (UMCSAWM) established affiliated to the Department of Civil Engineering, University of Moratuwa. The courses scheduled to commence in August 2014 are for both local and international students who wish to obtain a postgraduate degree/diploma in 1) Water Resources Engineering and Management or 2) Water Resources Management. The aim of the course is to provide a specialist training with a firm grounding on the principles, techniques, issues and practice of Water Resources Engineering and Management / Water Resources Management to practicing Engineers and scientists. At least the Graduate membership of a recognized professional Science Institute deemed equivalent to a Bachelor of Science Degree in a relevant field with a minimum of one (01) year period of appropriate experience, as approved by the Senate. If English is not the medium of instruction in the first degree of the candidate, valid TOEFL (a minimum of 500 points in paper-based, 173 in computer-based, or 61 in internet-based test) or I ELTS (a minimum of 5.0 in Academic Version) scores or equivalent. Selections will be based on the minimum eligibility requirements above, qualifications and experience, and performance at the interview. Fundamentals for Planning and Management of Water Conveyance and Drainage Systems. Advanced Irrigation Water Management for Food and Water Security. All academic work and research projects will normally be conducted in a three term academic year from Tuesday to Saturday (full time course) or in an equivalent duration from Friday to Saturday (part time course). After the successful completion of the first year with specified examinations and assignments, candidates may opt to obtain the P.G. Diploma. Those who wish to obtain a M.Sc. Degree should complete a research Project and submit a thesis based on the research study during the first year (full time) or second year (part time). South Asia Foundation (SAF) annually offers eight (08) full paid scholarships to full time participants from SAARC countries attending the MSc programms of the UMCSAWM, with the objective of promoting regional cooperation through South Asian Water Management Education. Applications for the scholarships should be made directly to the SAF/India. For further information and scholarship application forms, please refer to the SAF website or contact SAF chapters in respective SAARC countries. Course Coordinator, MSc Degree / P.G. Diploma in Water Resources Engineering and Management/Water Resources Management, Department of Civil Engineering, University of Moratuwa, Moratuwa. Duly completed applications should be forwarded to the same address. International students should send an e-mail to the Course Coordinator or refer to the Department webpage to obtain application details. 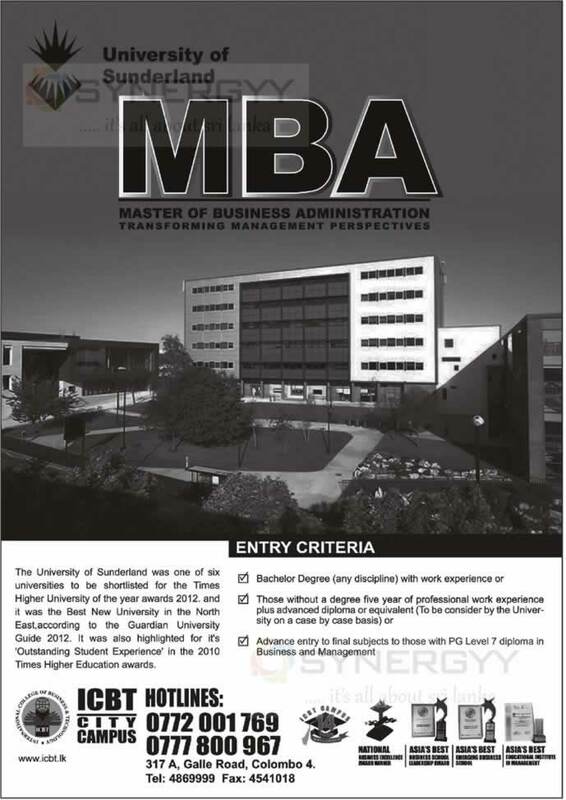 The Oxford College of Business invites applications from the ABE, CIM, CIMA ACCA OR EDEXCEL qualified students for the final year Bachelor Degree programmes for Top up with their professional qualification. The University of Sunderland was one of six universities to be shortlisted for the Times Higher University of the year awards 2012. And it was the Best New University in the North East According to the Guardian University Guide 2012. It was also highlighted for its ‘Outstanding Student Experience’ in the 2010 Times Higher Education awards. This two-year course is designed to develop academic knowledge and understanding of key business concepts and how to apply and evaluate business principles. Throughout the course, students’ academic abilities and management skills are enhanced. Lectures, workshops, Tutorials and assessment of your assignments. No.396, Galle Road, Colombo 03. 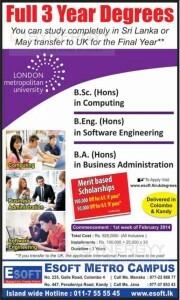 E mall: info@londonstafordscollege.lk Web: www.londonstanfordscollege.lk or contact Ms.Shabeena on 077 44 64 799. University of Colombo, Department of Finance, Faculty of Management & Finance invites applications for the Postgraduate Diploma in Banking & Finance. 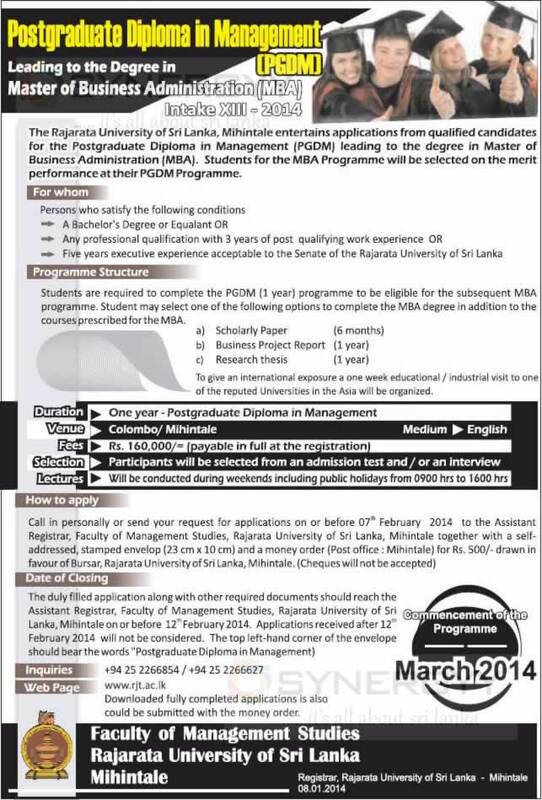 The Rajarata University of Sri Lanka, Mihintale entertains applications from qualified candidates for the Postgraduate Diploma in Management (PGDM) leading to the degree in Master of Business Administration (MBA). 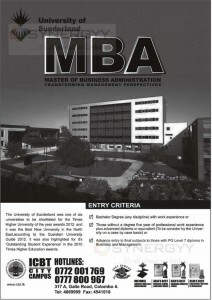 Students for the MBA Programme will be selected on the merit performance at their PGDM Programme. To give an International exposure a one week educational / industrial visit to one of the reputed Universities in the Asia will be organized. 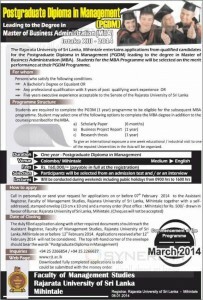 The Open University of Srilanka invites applications for Bachelor of Education degree programme for especially on Natural sciences; for the academic year of 2014/2015. Bachelor of Education (Natural Sciences) Programme is a four academic year programme especially planned for Science/Mathematics teachers The Faculty of Education conducts the level 5 and level 6 of the programme. The applicants should posses the following qualifications to register for levels 5 and 6 of the programme. Obtained eligibility in all courses (36 credits) at Level 5 of the B. Ed (Nat. 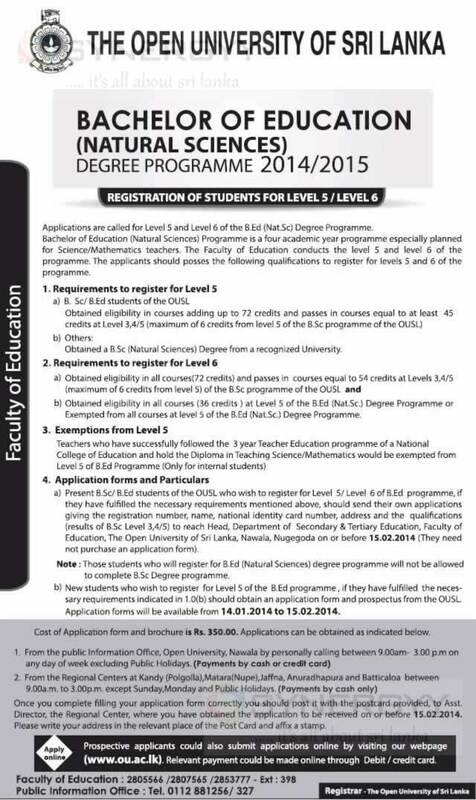 Sc) Degree Programme or Exempted from all courses at level 5 of the B. Ed (Nat. Sc.) 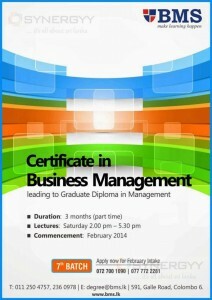 Degree Programme. Note : Those students who will register for B.Ed (Natural Sciences) degree programme will not be allowed to complete B.Sc Degree programme. 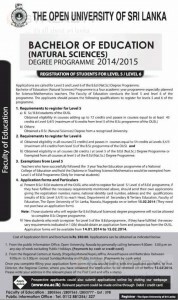 New students who wish to register for Level 5 of the B. Ed programme, if they have fulfilled the necessary requirements indicated in 1.0(b) should obtain an application form and prospectus from the OUSL Application forms will be available from 14.01.2014 to 15.02.2014. Cost of Application form and brochure is Rs. 350.00. Applications can be obtained as indicated below. Once you complete filling your application form correctly you should post it with the postcard provided, to Asst. Director, the Regional Center, where you have obtained the application to be received on or before 15.02.2014. Please write your address in the relevant place of the Post Card and affix a stamp. 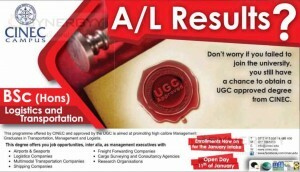 Prospective applicants could also submit applications online by visiting our webpage (www.ou.ac.lk). Relevant payment could be made online through Debit / credit card. 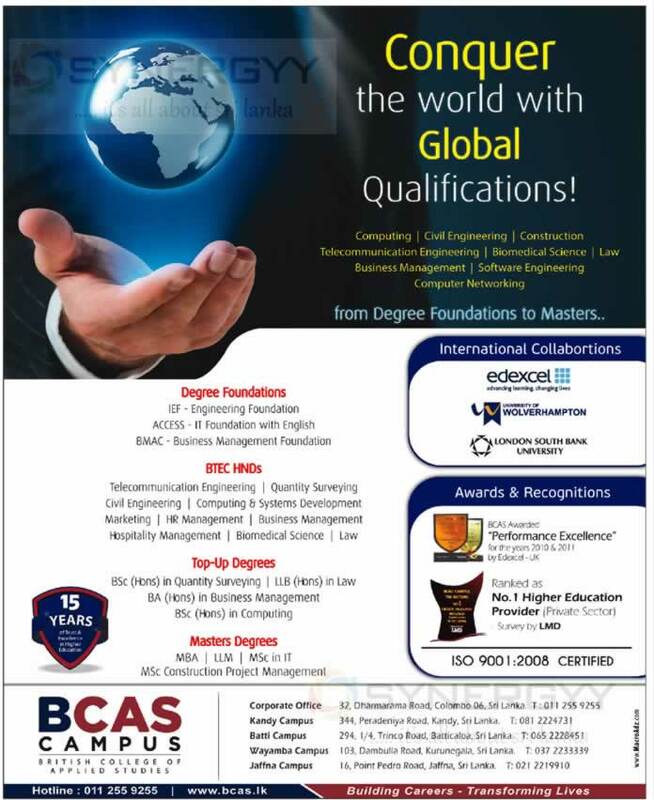 BCAS Campus is a leading private institution offers many degree programmes affiliated by Edexcel, University of Wolverhampton and London South Bank University. The Australian Technical and Management College offers you an Bachelor of Business Management Top-up degree programme with 7 Modules in 8 Months period. 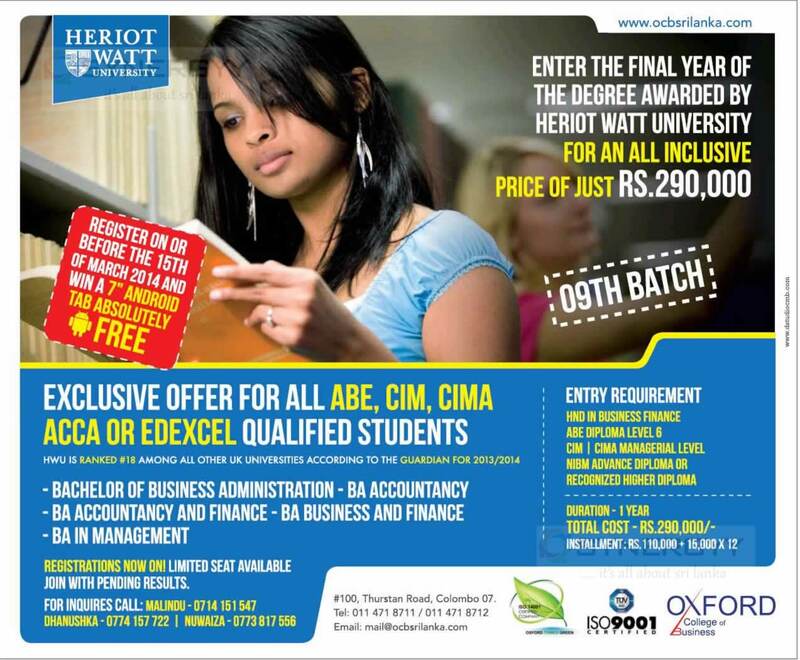 Direct entry for Higher National Diploma (HND) or equivalent qualifications including partly qualified CIMA, CIM & CA students. 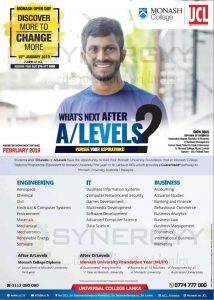 The Australian Technical and Management College is the first Australian Top-up degree to be introduced in Sri Lanka with a range of business subjects to acquire a sound working knowledge of business concepts. This top up degree programme is sets to be give both theoretical knowledge & practical insights to the students. For more information Call Akila on 0772 722 390 or visit Federation University, Sri Lanka Study Centre. No 12 d, Haig Road, Colombo 4. The BMS Sri Lanka invites applications for the BMS Certificate in Business Management leading to Graduate Diploma in Management. Today, Business and Commerce are global enterprises. 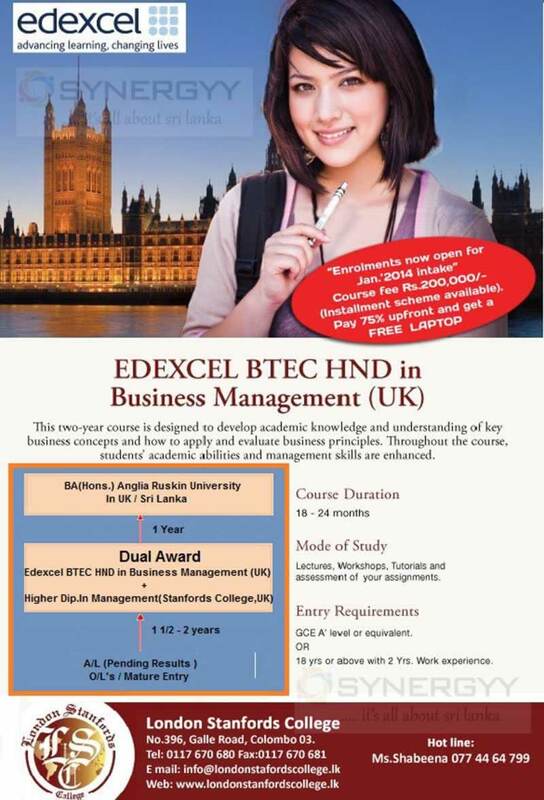 Our British degrees in Business Management help students to graduate with employable skills and to be globally competitive. APIIT Business School offers a number of British Degrees in Business Management from Staffordshire University, UK; choose a programme to suit your interests and career aspirations. Invest in your future, today. 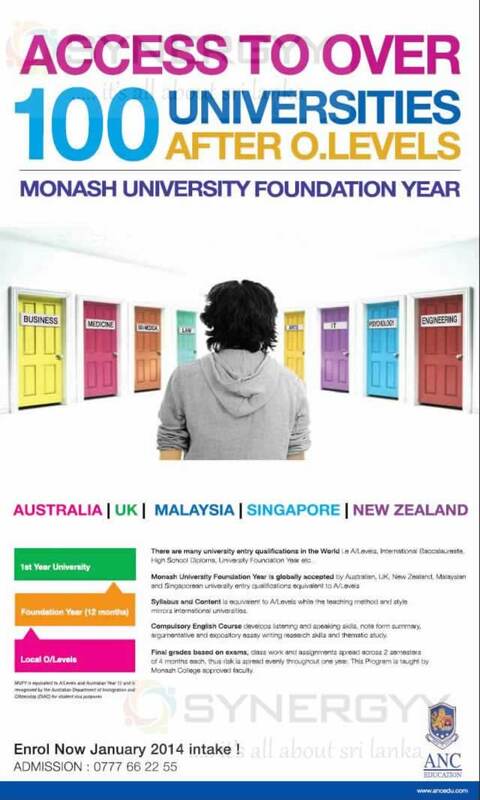 ANC offers a wide range of the Degree programmes for the After G.C.E (O/L) Students with the Monash University Foundation year. The foundation year programme is accepted by across the world more than 100 universities and it will give you a pathto continue your degree programmes in Australia, UK, Malaysia, Singapore and New Zealand. 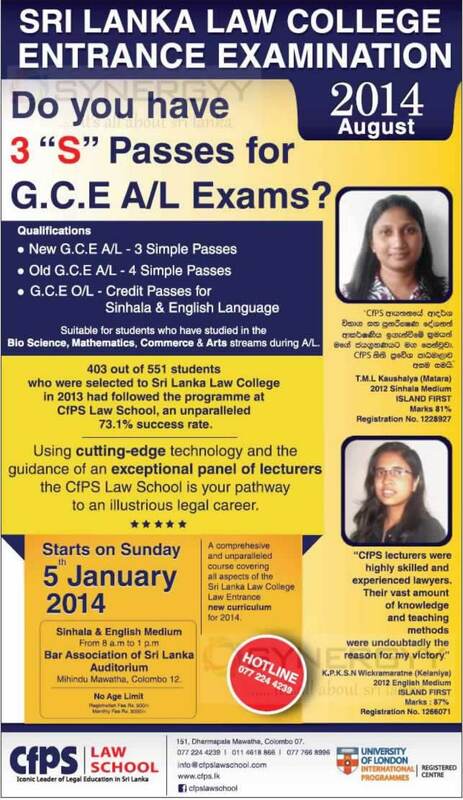 Srilanka Law College is only way to become lawyer in Sri Lanka, the CFPS invites applications for the Sri Lanka Law College Entrance Examination 2014 August. 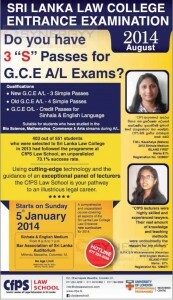 To do Sri Lanka Law College Entrance Examination you needs to have 3 “S” Passes for G.C.E A/L Exams and No Age Limits anymore. 403 out of 551 students who were selected to Sri Lanka Law College in 2013 had followed the programme at CfPS Law School, an unparalleled 73.1% success rate. For more information see below image or contact CFPS on 151, Dharmapala Mawatha, Colombo 07. 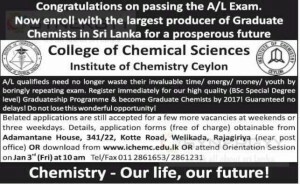 The Institute of Chemistry invites applications for the B.Sc Special Degree in Chemistry for January 2014. 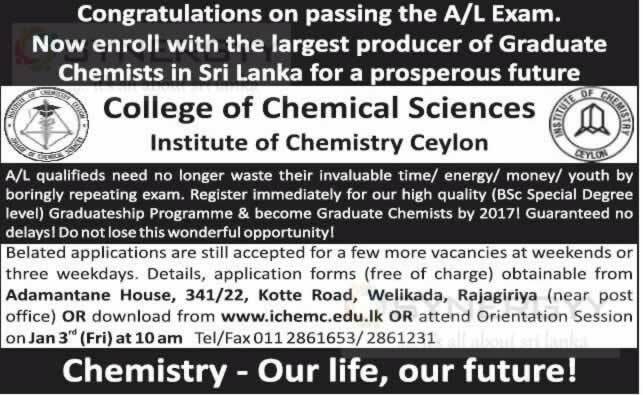 Register now and become graduate chemists in 2017. A/L qualified need no longer waste their invaluable time/ energy/ money/ youth by boringly repeating exam. Register immediately for our high quality (BSc Special Degree level) Graduateship Programme & become Graduate Chemists by 2017. Belated applications are still accepted for a few more vacancies at weekends or three weekdays. Details, application forms (free of charge) obtainable from Adamantane House, 341/22, Kotte Road, Welikada, Rajagiriya (near post office) OR download from www.ichemc.edu.lk. The E-soft College of Engineering & Technology invites applications for the 3 Year Degrees programmes of B.Sc (Hons) in Engineering. 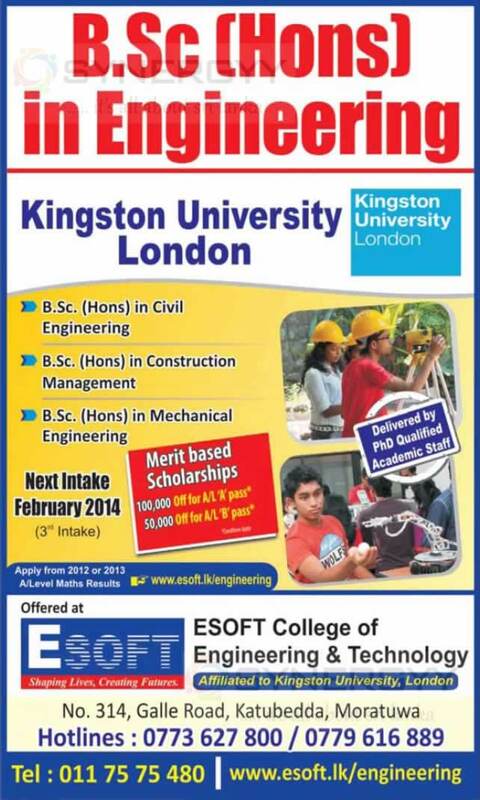 The degrees are affiliated by Kingston University London and special scholarships available for those who obtained A or B passes in G.C.E (A/L). 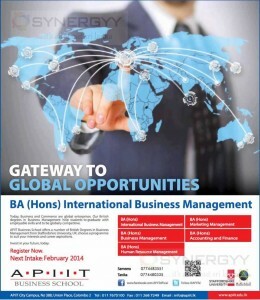 Apply soon as possible for the new enrolment in February 2014. 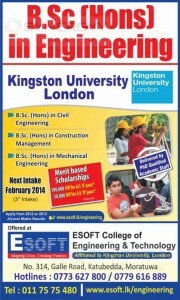 For more information see below image or contact E-Soft College of Engineering & Technology No. 314, Galle Road, Katubedda, Moratuwa. 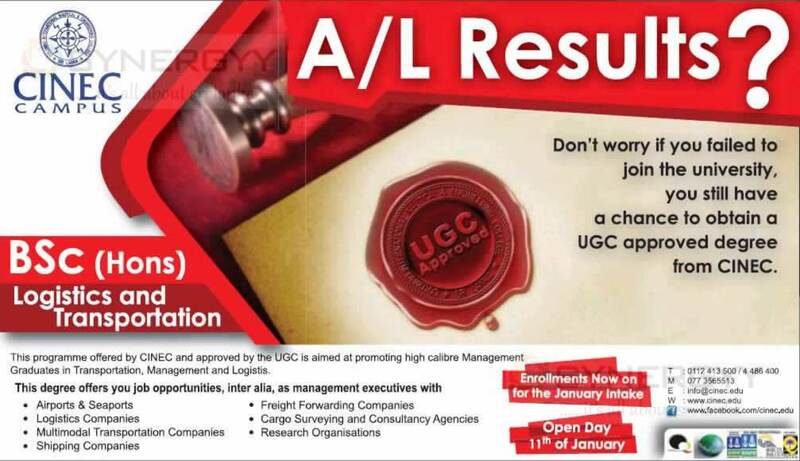 CINEC Sri Lanka invites applications for the BSc (Hons) Logistics and Transportation, This programme offered by CINEC and approved by the UGC is aimed at promoting high calibre Management Graduates in Transportation, Management and Logistic. This degree offers you job opportunities, inter alia, as management executives with Airports & Seaports, Freight Forwarding Companies, Logistics Companies, Cargo Surveying and Consultancy Agencies, Multimodal Transportation Companies, Research Organisations or Shipping Companies. 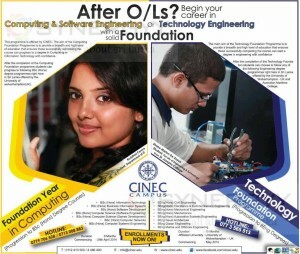 Enrolments are open now for January 2013 and open day will be on 11th January 2013, for more information contact to CINEC on 0112 413 500 or 0114 486 400 or call 077 3565513. The E-Soft Metro Campus invites applications for the 3 Year Degrees programmes of Business Administration and Computing. 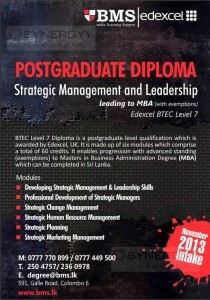 You can study completely in Sri Lanka or May transfer to UK for the Final Year. The degrees are affiliated by London Metropolitan University and special scholarships available for those who obtained A or B passes in G.C.E (A/L). 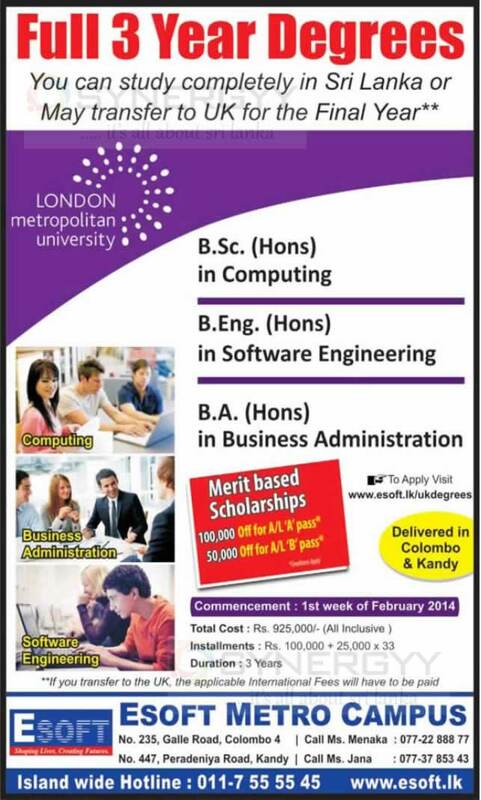 Apply soon as possible for the new commencement on 1st week of February 2014. 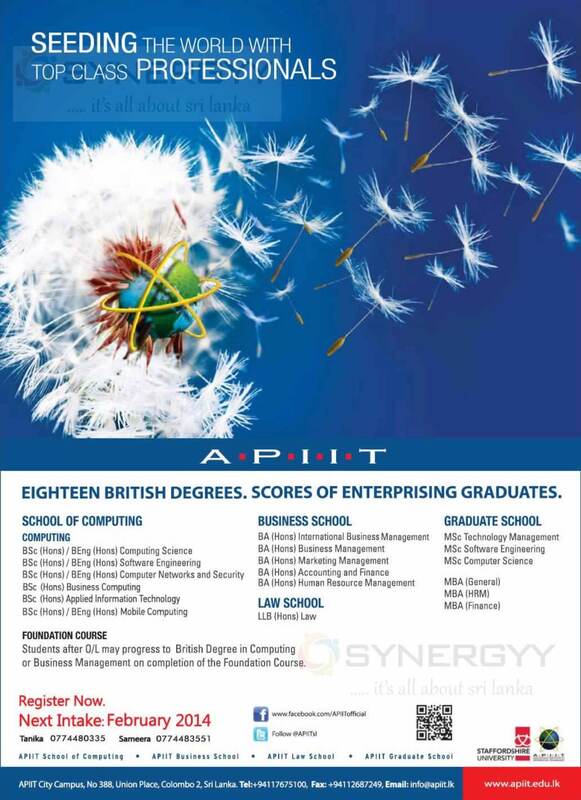 APIIT Sri Lanka invites applications for bachelor degree Programmes for the Business, Computing, Law and Graduate for February 2014 intakes. Those students after O/L may progress to British Degree in Computing or Business Management on completion of the Foundation Course. 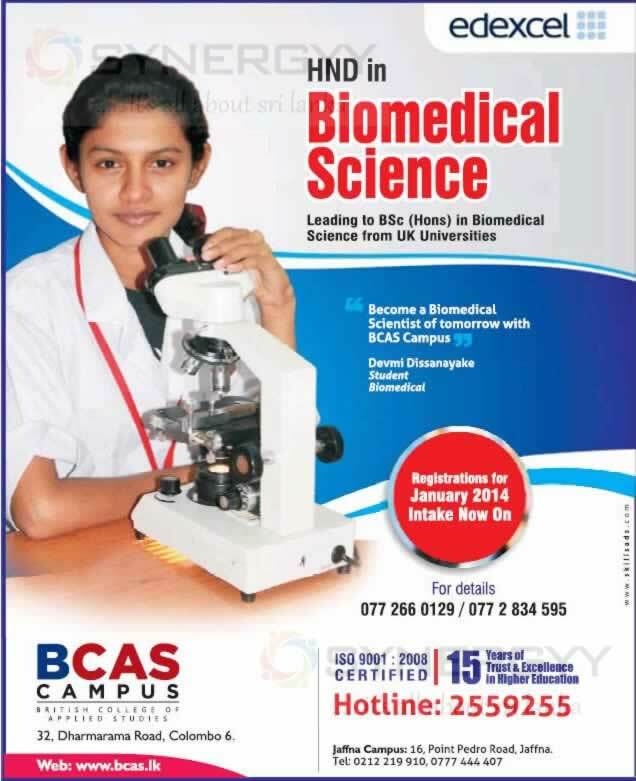 BCAS a leading Educational Institute in Colombo invites applications for the HND in Biomedical Science in Colombo and Jaffna. This HND in Biomedical Science is leading to BSc (Hons) in Biomedical Science from UK Universities. 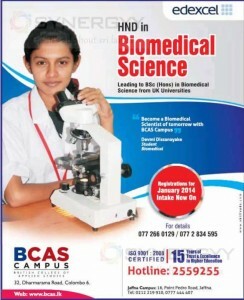 This is a one of the key institution offers bio medical science programme in Colombo Sri lanka, so registrar now for January 2014 Intakes. 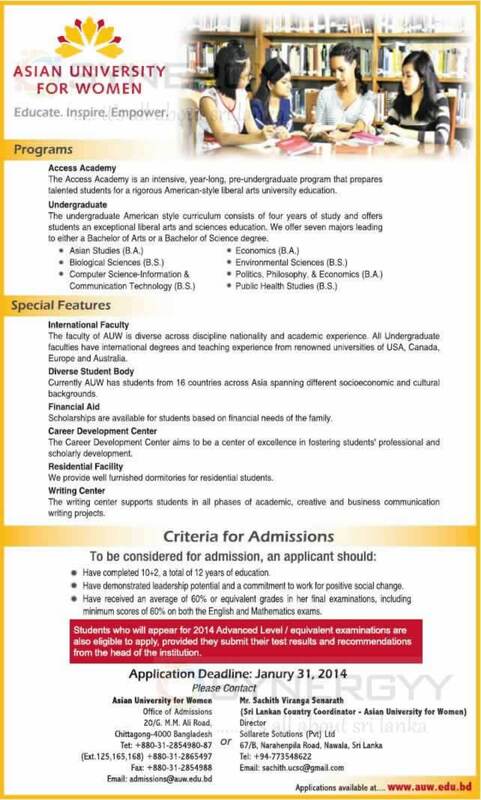 Asian University for Women is one of the leading Institution form Bangladesh offering wide range degree programmes. 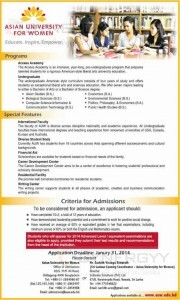 Now Srilankan students could apply for the University Enrolment in February 2014, and Application Open till 31st January 2014. The Access Academy is an intensive, year-long, pre-undergraduate program that prepares talented students for a rigorous American-style liberal arts university education. The undergraduate American style curriculum consists of four years of study and offers students an exceptional liberal arts and sciences education. We offer seven majors leading to either a Bachelor of Arts or a Bachelor of Science degree. The faculty of AUW is diverse across discipline nationality and academic experience All Undergraduate faculties have international degrees and teaching experience from renowned universities of USA, Canada, Europe and Australia. Scholarships are available for students based or financial needs of the family. The Career Development Centre aims to be a centre of excellence in fostering students’ professional and scholarly development. We provide well furnished dormitories for residential students. The writing centre supports students in all phases of academic, creative and business communication writing projects. Have completed 10+2 a total of 12 years of education. Have demonstrated leadership potential and a commitment to work for positive social change. Have received an average of 60% or equivalent grades in her final examination, including minimum scores of 60% on both the English and Mathematics exams. Students who will appear for 2014 Advanced Level / equivalent examinations are also eligible to apply, provided they submit their test results and recommendations from the head of the institution. NEXT Campus was set up by a group of professionals who are holding senior management positions in the Corporate Sector and who have in common the passion of empowering young executives with the knowledge, skills and competencies required for career advancement and personal development. With over 50 years of cumulative experience in business & academia between them, the founder directors marshaled a team of likeminded professionals & academics to transform young executives into professionals who can effectively contribute towards the achievement of their employers’ Corporate Goals whilst enhancing their personal competencies. The Next Campus is offered many Degree and Professional qualification in Sri Lanka with affiliated with many foreign universities and Professional body. The Board of Management is more helpful to the students to obtain more jobs oriented services to the students specially allotting job interviews and internship placement in Next Campus itself. The cost of Degree programme is affordable compare to any other professional qualification and degree offered in Sri Lanka, the cost are very much affordable to entry level students to obtain their basic qualifications. But this is not much recognized as best ranged university or best range professional learning partners. It’s sad to see that NEXT campus also offering free iPods or Free Laptops for their enrollments, which is not acceptable by my ethical concern, which make myself to feel bad against to NEXT Campus. Applications are invited from qualified persons for enrolment in the Master of Arts Qualifying (MAQ), Master of Arts (M.A. ), Master of Philosophy (M.Phil) and Doctor of Philosophy (Ph.D) Degree Programs conducted by the Faculty of Graduate Studies in the disciplines listed under the respective Board of Study of the Faculty. History, Archaeology; M.A.Q., M.A. by Course work, M.A. by Research, M.Phil and Ph.D.
Anthropology; Only M.A. by Research, M.Phil. and Ph.D.
Sociology; Only for M.A. by Course work, M.A. by Research, M.Phil. and Ph.D.
Criminology; Only for M.A. by Course work, M.A. by Research, M.Phil. and Ph.D. Political Science; Only for M.A.Q. M.A. by Research, M.Phil. and Ph.D.
Geography; Only for M.A. by Course work, M.A. by Research, M.Phil. and Ph.D.
Pali, Buddhist Philosophy, Buddhist Civilization, Philosophy and Psychology, Sinhala, Sanskrit, Cultural Studies, Hindi; M.A.Q., M.A. by Course work, M.A. by Research, M.Phil. and Ph.D.
Mass Communication ; Only for M.Phil. and Ph.D.
Hindi; Only for M.A.Q. M.A. and M.Phil. Statistics, Physics, Mathematics, Physical / Analytical Chemistry, Computer Science, IT only for M.Phil. and Ph.D.
Botany, Zoology, Forestry and Environmental Science, Chemistry, Food Science and Technology; Only for M.Phil and Ph.D.
Anatomy, Biochemistry, Food & Nutrition, Physiology, Parasitalogy, Microbiology, Pharmacology, Forensic Medicine, Community Medicine, Clinical Medicine, Surgery Paediatrics, Obstetrics and Gynaecology, Family Medicine, Pathology, Psychiatry, Medical Education and Health Sciences: Only for M.Phil and Ph.D.
Only those who are registered with the Sri Lanka Medical Council (SLMC) are eligible to apply for M.Phil., Ph.D, Degrees in Clinical subjects. Relevant information and application forms can be obtained from the Senior Assistant Registrar, Faculty of Graduate Studies, University of Sri jayewardenepura, Gangodawila, Nugegoda on production of receipt in support of a payment of Rs. 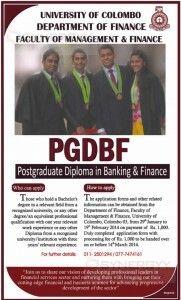 1000/= to University Account 0097-1-001-8-2315467 at the People’s Bank, Gangodawila, Nugegoda. Paying vouchers are obtainable from the Office of the Faculty of Graduate Studies, Applications will be accepted upto 31.12.2013. The closing date will not apply to those applicants who wish to register for courses in M.Phil and Ph.D. The Students who wish to register under the Board of Study 1 and 2 will be considered for registration of 01st January / 1st July. In a particular year depending on the time of submission of application and completion of prerequisites if any. The Students who wish to register under the Board of Study 03, 04 and 05 will be considered for registration on 01st January / 01st April / 01st July / 01st October in a particular year depending on the time of submission of applications and completion of pre requisites if any. Applicants who wish to register for courses in the Life Sciences, Physical Sciences or Medical Sciences should ensure that they have research funds / grants to enable them to undertake the proposed study. They are advised to consult the relevant Heads of the Department for further information prior to submitting the formal application. BTEC Level 7 Diploma is a postgraduate level qualification which is awarded by Edexcel, UK. It is made up of six modules which comprise a total of 60 credits. It enables progression with advanced standing (exemptions) to Masters in Business Administration Degree (MBA) which can be completed in Sri Lanka. Necessary arrangements have been made to conduct the above Examination from 09th December, 2013. Admission cards indicating the examination dates and centres have been posted to the relevant candidates to their personal addresses. Any candidate who does not receive the admission card by 02nd December 2013 should call over personally at the Centre for Distance and Continuing Education of the University of Kelaniya, along with his / her National Identity Card / Student Identity card and relevant documents to obtain a duplicate of the admission card.